Okayu is a Japanese porridge renowned for its ability to cure anything from garden-variety stomach ailments to hangovers. Healing properties aside, I just love it as a savory breakfast. 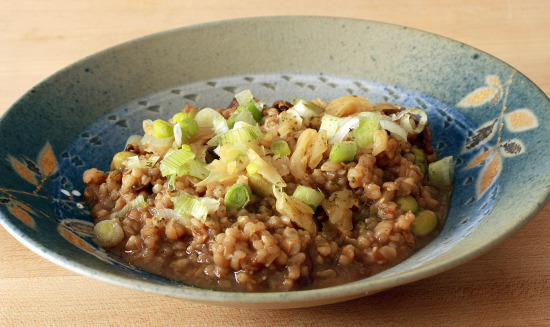 To make okayu, you use a larger volume of liquid than is typically used to make rice and you cook it for a fairly long time: you want the result to be “soupy”. There are many ways to make okayu, but often it is quite plain: with white rice, water, and maybe a little poached chicken. Here I’ve used more nutritious brown rice and added some flavorful stock, vegetables, and garnishes. The idea for the matcha salt isn’t mine; it’s from Eric Gower. To make it, mix 1/4 cup course sea salt with 1 teaspoon of powdered matcha green tea. Use as a finishing salt for the okayu. When it has finished cooking, scoop the okayu into individual serving dishes and top each one tablespoon each of the minced green onion and the pickled ginger. Add a drizzle of the optional sesame oil and a generous sprinkling of the matcha salt before serving; I also love this with an egg cooked in organic coconut oil served on top! I have fresh Shiitakes. How would I modify the recipe to include those? I would use about 1 cup of sliced fresh shiitakes, maybe a bit more…I don’t know how many you have. I don’t think any other modifications are necessary, just keep an eye on the liquids because maybe you’ll need less with the fresh mushrooms…let me know how it turns out! I made up a version this morning. I linked back to your recipe so people could have another variation. Unfortunately, I seem to be out of mushrooms, dried or otherwise, & edamame. I bet they are fantastic with the rice. I used peas, added some thin strips of carrot and instead of rice, I used pearl spelt and I added a bit of kombu dashi to the “rice” while it cooked to add a bit of umami. I devoured every last grain of “rice.” You’re right the fried egg on top is lovely. I have a question though. Do you think this could be made the night before and reheated for breakfast? 1 hour in the morning on the stove top is a bit much for my foggy brain. Thanks again for a great post and inspiration! You can most certainly make this the night before! I made a large batch and reheated it all week for myself- nothing wrong with morning time saving techniques! Thanks for letting me know…although with a big batch, I’d be tempted to eat the entire thing the first day of the week. Thanks for your ochazuke recipe as well! This looks tasty! I like the sound of matcha salt.